We have just returned this weekend from one of the biggest Warhammer tournaments in Poland, where we also took part in painting competition – Grey Seer. This was the second edition of this contest. 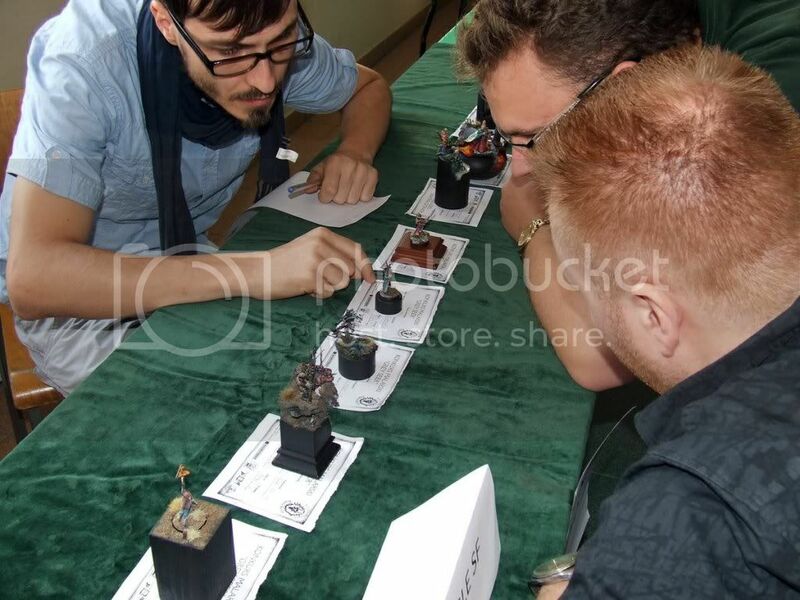 It`s a side-event to the one of the biggest tournaments – DMP, a national team championships in Warhammer Fantasy Battle. This year together Szary and Rychu had opportunity to take part as gamers and painters in both events. This edition of GS was obviously dedicated more to professional painters than gamers-hobbists. The high level of works and presence of some Polish recognizable painters, amongst which were Ana from Chest of Colors, Przemo, Edwin Smolinski or freshly GD awarded Camelson, had putted a great impact on the contest and putting the quality far beyond typicall gamers contest. While judges where busy examinating mianiatures the few painters where sharing their own experience during painting workshops. Anyone interested in painting freehands or about colour theory could hear many tips from the more experienced colleagues. The awards ceremony was quite fast, without any delays thanks to Slawol, who well organized all the stuff. While we were busy rolling dices and wondering why the luck isn`t on our side, we were asked leave tables for a moment to receives awards. In that way Rychu was recognized for his Blood Angel Death Company squad as a finalist in Diorama/Unit entry and Szary earned an award for the second place in Large Model category for his Verminlord. We are quite proud for these achievement, especially if we consider fact, that those were just a few non-contest dedicated models. We just grabbed some our gaming miniatures to give a shot! The full report from contest with pictures of all entries can be found on Chest of Colors website. As I said before, the whole contest was full of magnificent entries, and I think each one was well deserved. But despite that there is the one thing that makes me thinking. For a typicall reader or observer is hard to draw such conclusion, but if you take a closer look you will easily find that the contest was organized and judged by a team from Chest of Colors. Although for my taste of justice I found highly… innapropriete, when a husband judges in public contest the work of his wife. No matter if it`s deserved, there should be some standards saved. Of course it`s hard or even impossible to find people which are good oriented in miniatures painting and have standing amongst others and still they don`t know participants. To make things clear – I`m not accusing anyone, still I`m 100% sure that prizes were well deserved. Naturally I`m fully aware that I coulde be lonely in my opinion and that could start reaction similar to a putting cat among the pigeons. But I`m pointing only the facts and I`m open for constructive discussion. If someone have something to add I encourage to leave comment under this post. Congratulations to all winners and participants and special thanks to all who helped with the organization of this competition – especially to Slawol, who invented all this idea and run it smoothly.